Most drawers in our kitchen have standard pulls, but a few have none at all. This, obviously, makes opening said drawers a huge pain. I initially looked into using the same pulls from elsewhere in the kitchen for the pull-less drawers, but they were $4 each. That was enough to make me think about a cheaper, more fun solution. Enter the Othermill Pro and some 0.025"-thick 6061 aluminum sheet. 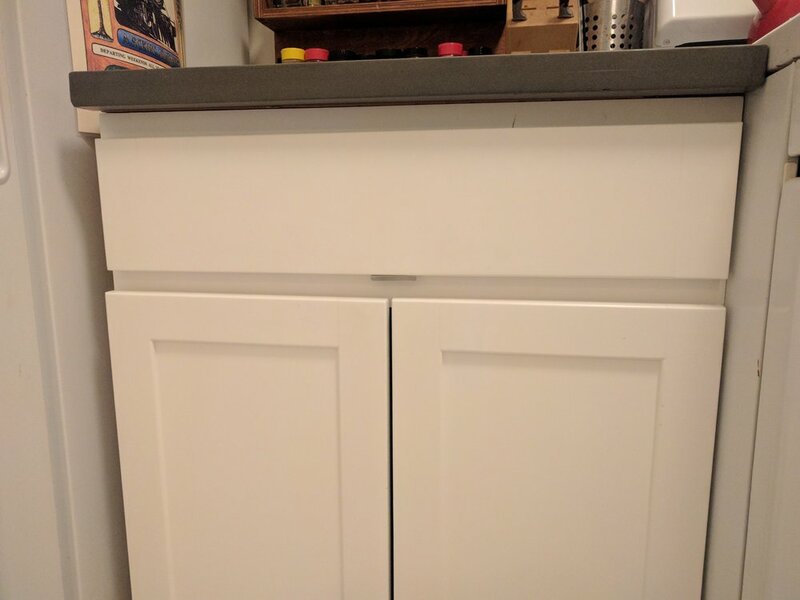 After some milling and two quick bends, I had a low-profile, cheap pull that could be attached to the back of each drawer face with two screws. So yeah, opening these drawers without a pull was pretty awful. This one in particular is tough, as it contains all of our utensils, so it's pretty heavy. Much better now, and super stealth! I tried Onshape out for the CAD on this part, as they support sheet metal. I was impressed! Many of the features are very similar to SolidWorks, unsurprinsgly, so it didn't take me long to get up to speed. Unfortunately, I order to do the CAM, I had to export a flat pattern from Onshape and import that into Fusion360. You'll notice I used an engraving tool to lightly scribe the bend line on each part before cutting the contour, but that's totally optional.